M/v “Plancius” was built in 1976 as an oceanographic research vessel for the Royal Dutch Navy and was named “Hr. Ms. Tydeman”. The ship sailed for the Dutch Navy until June 2004 and was eventually purchased by Oceanwide Expeditions.The vessel was completely rebuilt as a 114-passenger vessel in 2009 and complies with the latest SOLAS-regulations (Safety Of Life At Sea). M/v “Plancius” is classed by Lloyd’s Register in London and flies the Dutch flag. M/v “Plancius” accommodates 114 passengers in 53 passenger cabins with private toilet and shower in 4 quadruple private cabins, 39 twin private cabins (ca. 15 square meters) and 10 twin superior cabins (ca. 21 square meters). The vessel offers a restaurant/lecture room on deck 3 and a spacious observation lounge (with bar) on deck 5 with large windows, offering full panorama view. M/v “Plancius” has large open deck spaces (with full walk-around possibilities on deck 3), giving excellent opportunities to enjoy the scenery and wildlife. She is furthermore equipped with 10 Mark V zodiacs, including 40 HP 4-stroke outboard engines and 2 gangways on the starboard side, guaranteeing a swift zodiac operation.M/v “Plancius” is comfortable and nicely decorated, but is not a luxury vessel. Our voyages in the Arctic and Antarctic regions are and will still be primarily defined by an exploratory educational travel programme, spending as much time ashore as possible. This vessel will fully meet our demands to achieve this.The vessel is equipped with a diesel-electric propulsion system which reduces the noise and vibration of the engines considerably. The 3 diesel engines generate 1.230 horse-power each, giving the vessel a speed of 10 – 12 knots. The vessel is ice-strengthened and was specially built for oceanographic voyages.M/v “Plancius” is manned by 17 nautical crew, 19 hotel staff (6 chefs, 1 hotel manager, 1 steward-barman and 11 stewards / cabin cleaners), 8 expedition staff (1 expedition leader and 7 guides-lecturers) and 1 doctor. 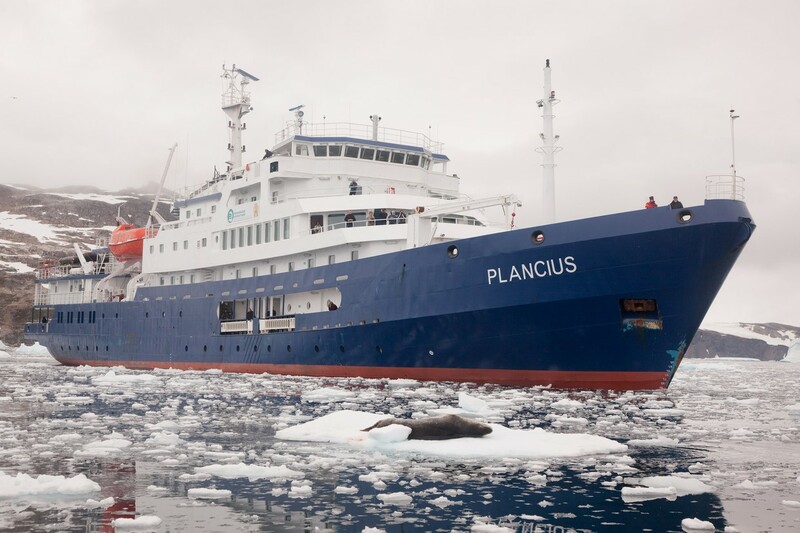 Ice class: Plancius was built&nbsp;for Ice conditions. To reach these ice-conditions she has a strengthened bow and stern. The hull is thicker and the whole construction on the waterline of the vessel is reinforced by using extra frames. Where the normal frame spacing is 65cm, we have on the bow-line and stern also frames in between so there the frame spacing is approx 30cm. Because Plancius was built to do surveys she has a special six blade bronze propeller, the shape of the propeller makes Plancius a very silent ship. Plancius has a Lloyds class notation 100A1 Passenger ship, Ice Class 1D at a draught of 5 meters (which is our waterline).